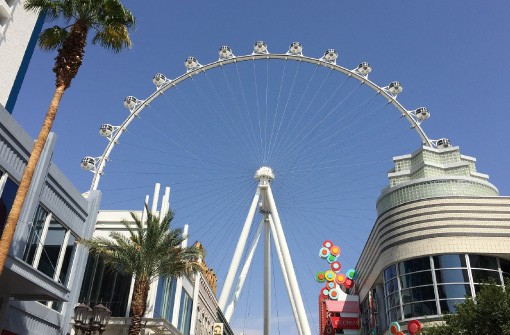 Las Vegas Linq Ferris Wheel - Custom Engineering Projects | Thern, Inc. Located in Las Vegas, the High Roller is the Linq’s world famous and world record-holding observation Ferris wheel. Standing 550 feet tall, it is a mammoth structure. During construction, a set of TA5-16MK1 air winches were used to help lift and position the 112 support cables that anchor the wheel to the central axel. 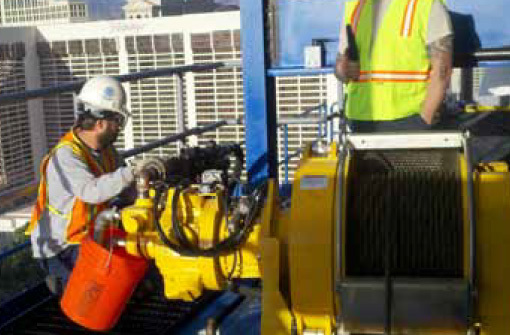 A pair of Thern air winches were used to aid in the construction of the Ferris wheel in Las Vegas. Thern air winches were used during construction to lift, position and hold the wire cables (spokes of the Ferris wheel) until the cables were fastened in place – much like a bicycle wheel. A Thern davit crane is also permanently attached to the center hub and is used for lifting equipment and tools up to the center hub platform for routine maintenance. Located right on the strip, the 550’ high Ferris wheel takes up to 1,120 people per half-hour high above the city in twenty-eight 40-passenger pods for spectacular views of Las Vegas day or night. The Ferris wheel has been validated by Guinness as the tallest observation wheel in the world.